In a fortuitous turn of events, archaeological excavations carried out at Lod for the upcoming Shelby White and Leon Levy Lod Mosaic Center (that will showcase the site’s wealth of previously explored mosaics) revealed yet another vibrant mosaic specimen dating from the Roman period. The 1,700-year-old artwork was successfully disassembled from its spot, thus allowing for its conservation and the continuation of the construction of the Visitor’s Center. When it comes to history, the ancient city of Lod in central Israel (derived from Biblical Lod or Lydda) boasts a legacy that passed through the antithetical themes of commerce, scholarship, and violence. Pertaining to the former points, Lod was one of the important Jewish centers since the 5th century BC, possibly fueled by the inhabitants who returned after the Babylonian captivity. However, by the latter half of 1st century BC till 2nd century AD, the settlement was subject to numerous instances of Roman intrusions, with two major wars – the First Jewish–Roman War (circa 66–73 AD) and the Kitos War (115-117 AD), playing their part in the significant destruction of the town. 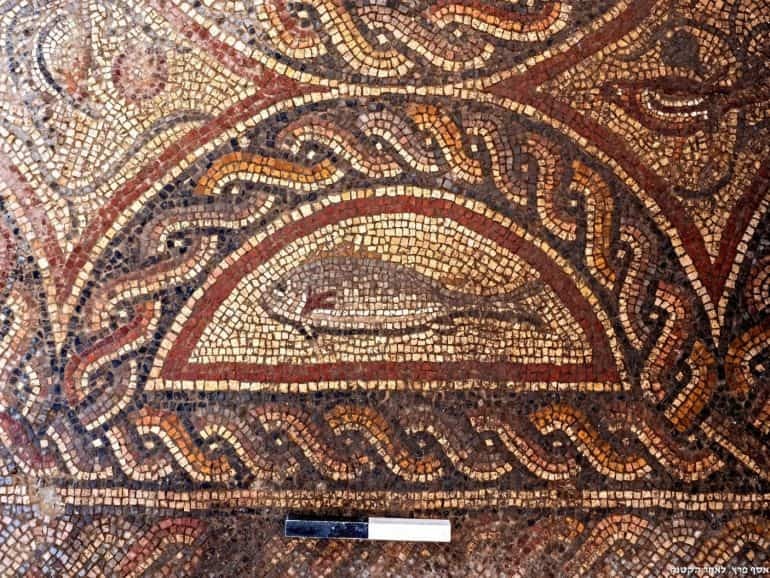 Details of the newly exposed mosaic at Lod. And it was only by 200 AD, when the settlement then known as Diospolis (“City of Zeus”), was elevated to the status of a Roman city. And while the urban scope was revived, the now Christianized city lost much of its original Jewish population. Interestingly enough, Diospolis is also considered as the traditional site of the martyrdom of St. George, the patron saint of England. In any case, the magnificent mosaic sections showcased here date from the extensive Romanized period of the city. Excavation works in the area date back to the early 1990s when archaeologist the late Miriam Avissar and her team unearthed the now world-renowned Lod Mosaic. Believed to be one of the most beautiful artifacts in the entire country, it is currently on display at Venice-based Cini Gallery. In the last few years, the mosaic had been exhibited in some of the world’s most famous museums, such as the Metropolitan Museum of Art in New York City, the State Hermitage in St. Petersburg, Russia as well as Paris’s Louvre Museum. Once completely constructed, Lod’s Visitor Center will be the mosaic’s permanent home. The famous Lod Mosaic discovered back in 1996. The villa was part of a neighborhood of affluent houses that stood here during the Roman and Byzantine periods. At that time, Lod was called Diospolis and was the district capital, until it was replaced by Ramla after the Muslim conquest. The building was used for a very long time. During this very same endeavor (in 2015), the researchers were greeted by an incredible specimen of a large mosaic, measuring 36 by 42 feet (approx. 11 by 13 meter). It was incidentally discovered during the then-ongoing construction of the aforementioned Visitor’s Center. 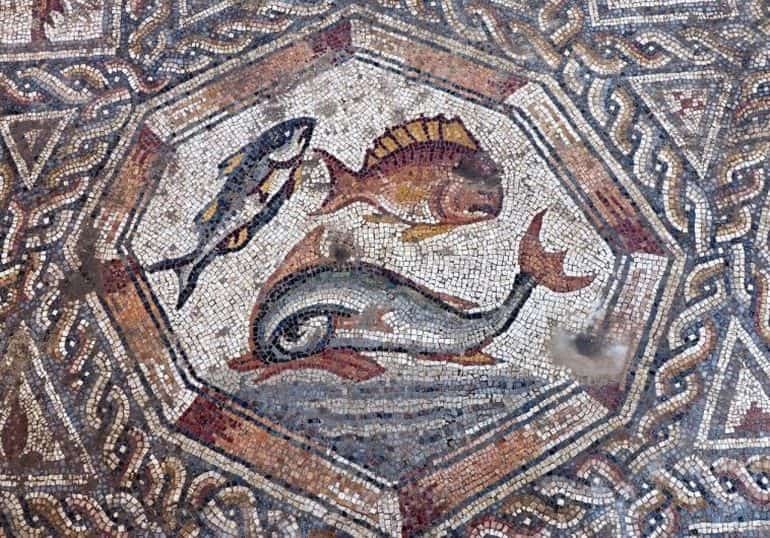 And just like the newly found mosaic in this year, the previous artwork also flaunted its fair share of stunning scenes of fish, hunted and hunting animals, flowers in vases, birds and so on. The archaeological excavation that we carried out this month was relatively small but contributed significantly to our understanding of the villa building. Thankfully, the main central panel of the mosaic was preserved. 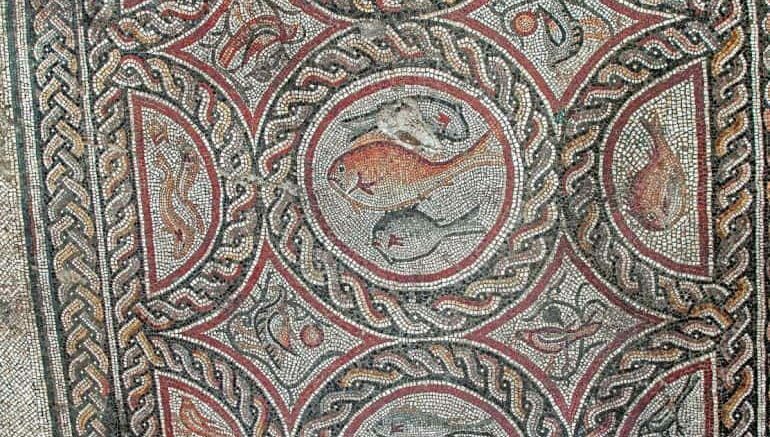 The figures, many similar to the figures in the earlier mosaics, comprise fish and winged creatures. 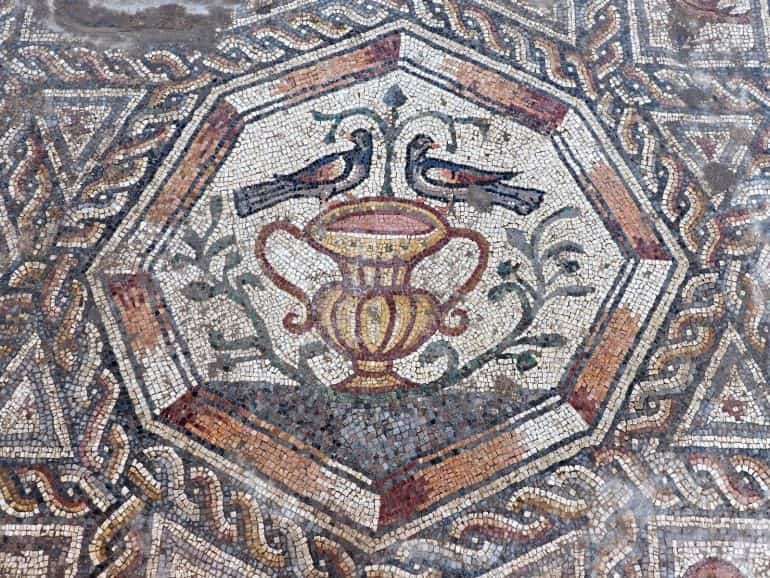 A fairly similar mosaic was found in the past in Jerusalem, on the Mount Zion slopes. The Lod mosaics, however, do not depict any human figures that are present in the Mount Zion mosaic. 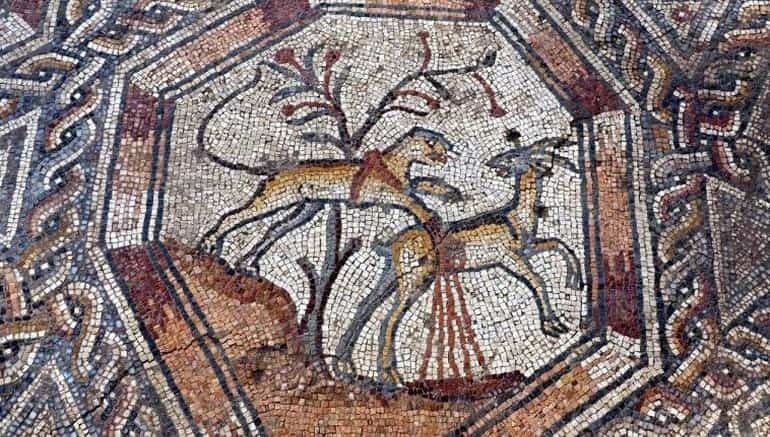 It is quite probable that the same artist produced both the mosaics, or that two artists worked from a similar design. 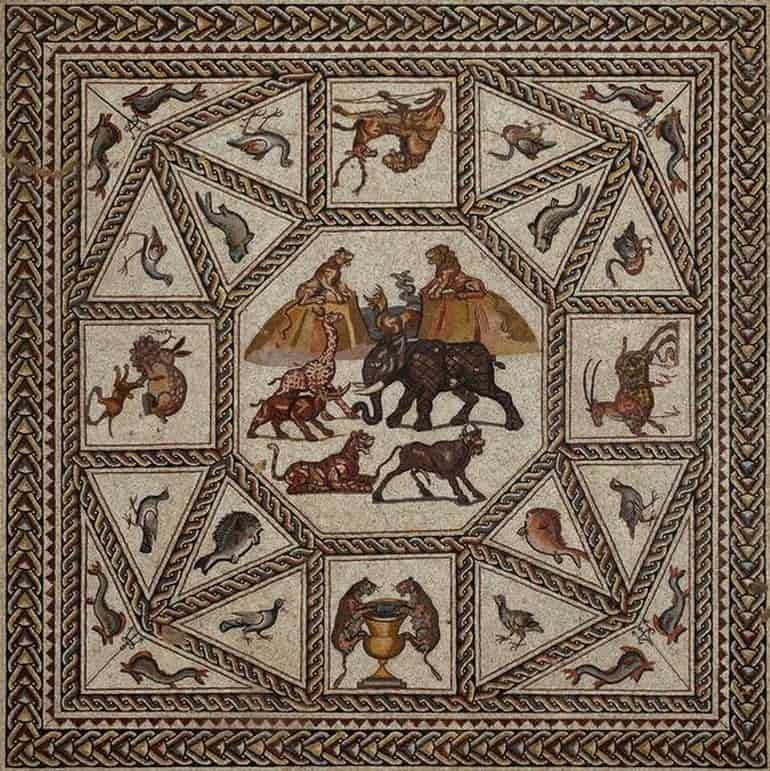 This type of mosaic is better known in the Western part of the Roman Empire. Also noteworthy are the rectangular marks that may denote the placing of the couches on which the participants of the banquet or feast reclined. These marks are common in similar villas and are an indication of the use of the space in the reception halls. If this is the case, then the villa may be much larger than we supposed. The discovery, in close proximity to the earlier hall, raises new questions: How large was the building? Did the villa comprise several reception halls? Where were the private living rooms? Was there a second story? These issues may be resolved in future excavations. 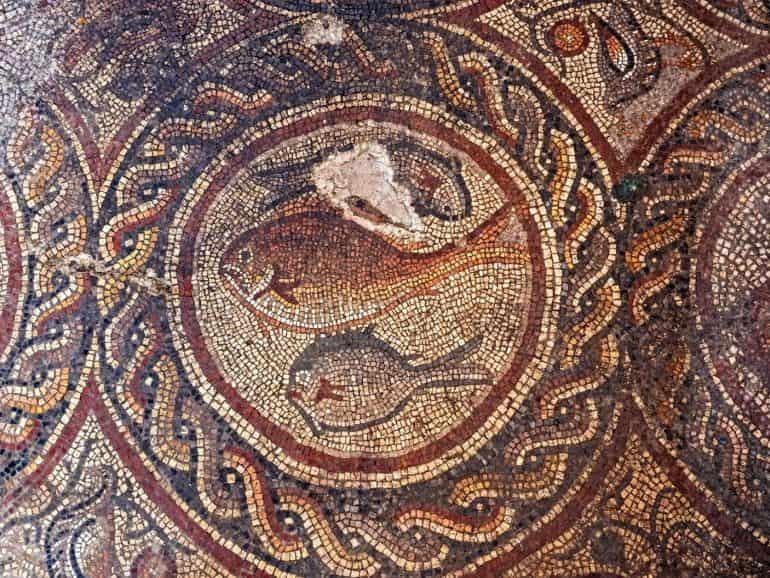 Details of the mosaic discovered in 2015.